EPCO's T8 UV Filtering Tube Guards provide the basic reduction of harmful UV energy by filtering 99.9% of harmful UV rays up to 390 nanometers*. Manufactured using thin-wall high tensile and impact resistant polycarbonate material that is flexible to hold the lamp to facilitate lamp changes; does not easily crack. Special UV additive filters UV rays better than acrylic materials with comparable wall thickness (0.016" wall thickness). Minimizes premature color shifting (fading) and deterioration that can be detrimental to food products, paper, natural and synthetic textiles, paints, coatings, woods and polymer materials, inc. Provides years of protection from dangerous UV light. Can readily be "field-cut" to length if desired. Sizes: T5, T8 and T12. Available in nominal 4-foot and 8-foot lengths. *Tested by two independent light testing laboratories. UV Filtering Tube Guards are sold ONLY in case quantities of 24 per carton. EPCO will not break case carton quantities! 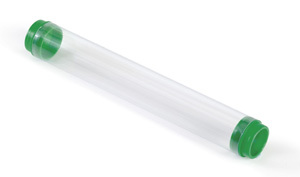 UV Filtering Tube Guards are not to be used with HO or VHO Lamps! The exception is UV Filtering T5 HD Series Tube Guard that is rated for use with a T5 HO Lamp.